I am not crazy about this card. I think I cut the horse to big but too late now! I do like the paisley barn though! Wouldn't it be great to be driving in the country and suddenly see a red paisley barn!! There are extra layers on the horse because I did go back and hide contour so I could have a black layer for the eyes. Now if I had figured out that I could use one of my Promarkers to just color the area like I did for the hooves and the nose I could have saved myself some time and cardstock! I do like the horse being the colors of a Palomino. I have always thought Palomino's were just gorgeous! 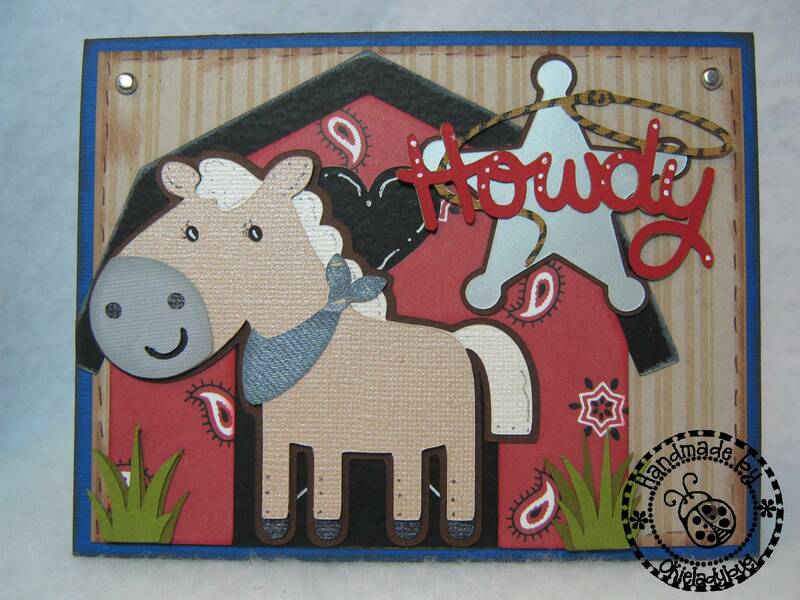 I think I should have put the Howdy with the star on the inside of the card so it would have made the front look a little less busy. 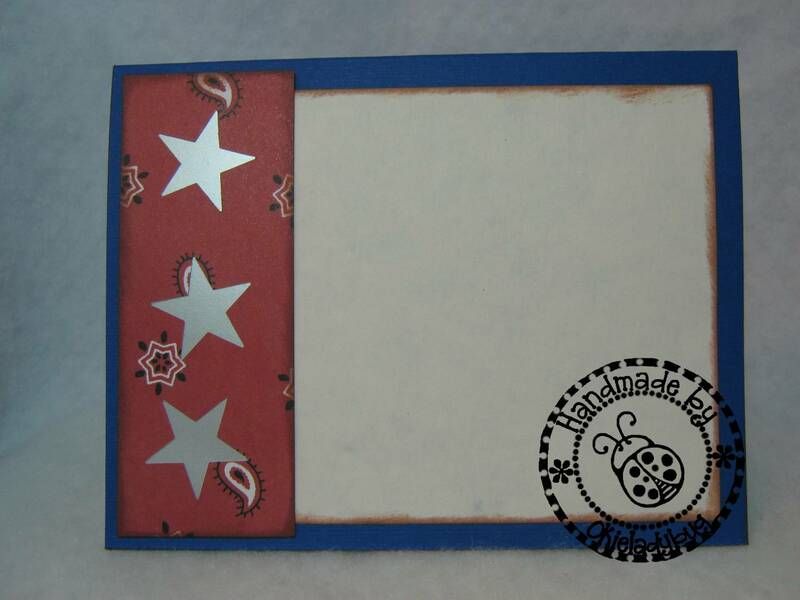 For the inside I just cut a strip of the paisley and used the Stampin Up small star punch and then backed it with the same metallic cardstock that I cut the star on the front of the card from. Tomorrow I will be posting a really cute owl card, it is also a Create A Critter theme. 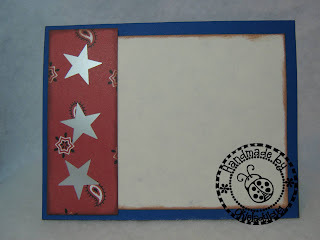 I also have stamp club tomorrow night so won't be posting any projects on Friday. HOWEVER, I will be posting the giveaway on Friday so be sure to check back!!! Cute! Cute! Cute! Love it. CUTE Card! I got this cart for my birthday...I can't wait to use it more...Thanks for the inspiration! LOVE it!! The barn is cool and the horse.. ADORABLE!! Love it Okie!! really love this card. i have someone in mind who would really enjoy this one...thanks again for all your nice work! Another great card. I love the patterned paper! Now this is really cute! That horsey is adorable! Another cute card! I finally got create a critter so am glad to see this card series you're making. 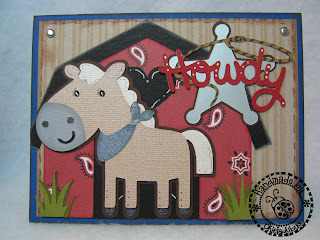 I love the paisley paper on the barn and the palomino horse. Thanks for sharing the cut file! That is SO DARN CUTE!! I can't get over it! Love the barn in the background - you are so creative and talented, sweetie! Okie, you made me feel good when reading your post because you sound just like me as I'm going through the trials and tribulations of how things look or fit as I'm making a card. And I guess all those "should have beens" and "should have done this" are how we learn so that the next time we make it, it will be even better! I still like your card! !--Pat N.
Too cute! Love the barn and that would be too cool to see one for real. LOL Thanks for the cut file. Love this, I've seen strange things driving in the country or sitting in the woods so a red paisley barn wouldn't surprise me, LOL. Another Cute Create a Critter card. I like it just the way it is with the star and howdy on the front. Lots of dimension. I like the inside the way it is too. Another great one from the great Okie! My Granddaughter will love this one. She has a horse mural on one of the walls in her bedroom. I really enjoy the Create a Critter Cartridge! There are sooo many fun Critters! LOL I've made several of them for people that request them from me.... 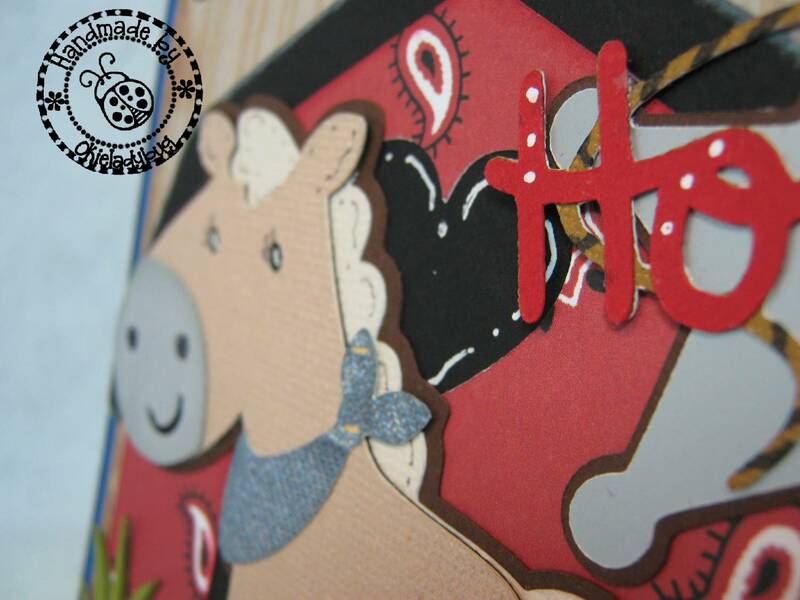 But I have to say I LOVE this horse card... It's soooo stinkin' CUTE! hello...i am commenting about a post back in september 2010 where you used the butterfly embossing set by cuttlebug. i have been looking for the die for a long time. only it was not embossed. and i am wondering if it is only available in the embossed format. someone told me it was cricut, but i cannot find it there. hoping you can help. Love Love Love!!! You did a mighty fine job there missy... ya hear?? With the paisley barn the over-sized pony makes it all so whimsical. Okie, this card couldn't get any cuter! Great job! Great card!! Your work is always wonderful!! This is so skinkin cute! You find the cutest things to make. I saw a lot of funky painted barns when I lived in the panhandle of Oklahoma, but I would have to agree, seeing a paisly barn would rock. Make a paint pony, they are my favorite. Guess I am going to have to get this cart just so I can make a paint pony. The paisley barn is darling. But then I live in Tennessee where is has always been the thing to paint your barn some way or the other. I think it looks cute! It makes the horse the center of attention and makes the barn look like it is in the distance!